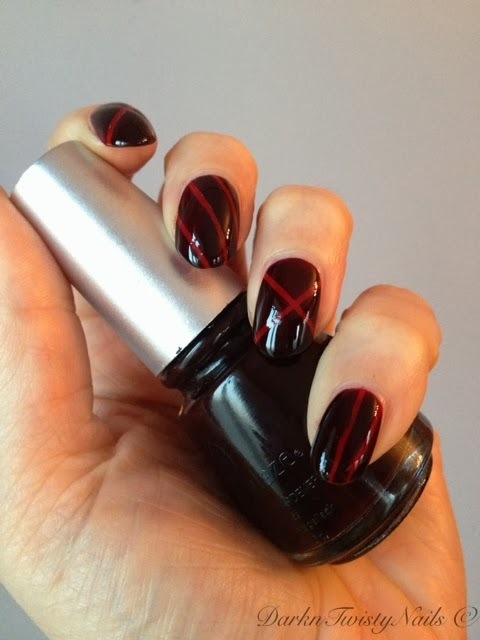 Another Monday has arrived and that means it's time for another Mani Monday. This weeks theme is Stripes. After a lot of sighing and trying to figure out how to get stripes on my nails without tape, I gave up and got out my striping tape. This time it gave me only a mild headache so I'm happy. The result is... well... wobbly is the best way to describe it, but hey, you can definitely tell I have stripes on my nails and that was the whole idea! I decided to use two untried polishes in my stash that, in my opinion, go great together. 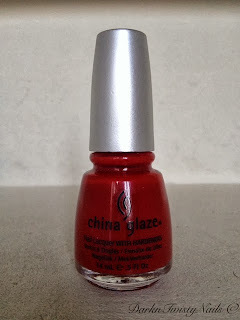 I started with 1 coat of China Glaze Phat Santa. Not bad for just one coat, right? This polish is great to work with, a little thin, so be carefull not to flood your cuticles, but really opaque and it dries really fast. I then began my battle with the sticky striping tape. To start of with, I of course couldn't find the start of my tape... Half an hour later I finally found it and cut of the pieces. Placing them on my nails was actually really easy after that! 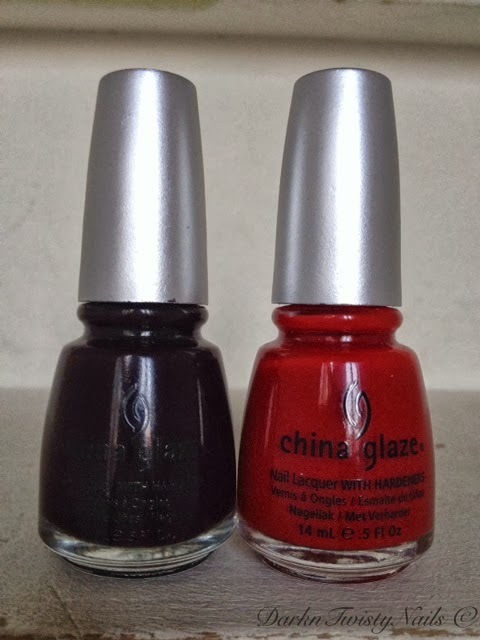 When I was happy with my (simple) design, I added the second layer of polish, China Glaze Naughty and Nice, a really deep, dark, vampy bloodred crelly polish. It was also a little on the thin side, but I think that's what you get with a jelly or crelly... 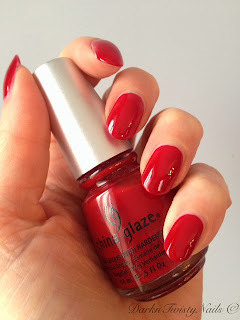 I don't know how opaque this polish is on its own, as I've never used it on it's own, but I used just 1 coat for this mani, because I had a fairly opaque base color underneath. The beautiful twosome, Naughty looks black in the bottle, but trust me, it's not! It really is gorgeous and perfect for fall/winter. This time I let the polish dry completely before taking off the tape and I think this works a lot better than leaving my polish a little wet. But my striping tape mani is never complete with a little (or big) mistake, so of course I bumped my pinky before I could take some swatch pictures... I really didn't feel like doing the whole thing again, so I opted to ignore my sowewhat ugly pinky. I hope you will too. 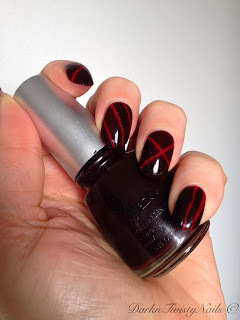 Have you ever used striping tape? What is the best way to use it and how do I get straight, sharp lines? Thanks for the tip, will try that next time! I'm still looking for sharp, clean lines, this tape wil NOT beat me! Ow... to bad... hope your nails feel better soon! Great color combo! Really nice Manicure! Such a great manicure Anca, I need to pick up some striping tape and give it a try. You should! 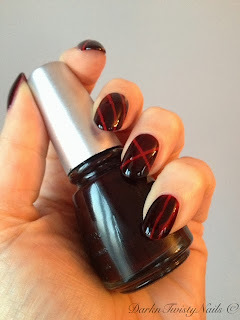 Such a great and (supposedly) easy way to spice up your mani.